How would you like an 11% cut to your paycheck? That’s exactly what’s happened to income investors who own long-term Treasuries (ChicagoOptions:^TYX). At the beginning of the year, 30-year U.S. Treasury yields (NYSEARCA:TLT) were above 3.90% but have trended lower. 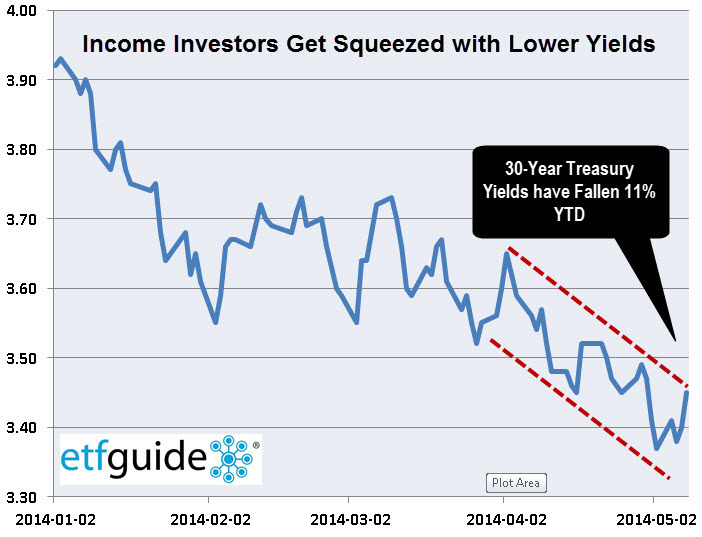 That’s not what income investors who piled into long-term Treasuries were expecting. Their plan was to capture more income by owning longer-term bonds. But it hasn’t worked out that way. What about stock dividend investors? U.S. stocks (NYSEARCA:SCHB) trading near all-time has meant lower yields for new investors. A similar thing happened during the dotcom boom of the late 1990s when dividend yields bottomed near 1.15%. Even for buy-and-hold types who say none of this matters, the S&P 500′s long-term dividend yield has been in 33-year decline. The S&P’s dividend yield is around 1.91% today versus 5.3% in the early 1980s. Put another way, today’s S&P 500′s (NYSEARCA:VOO) dividend yield is 63% less today compared to the early 1980s! The income investor (Nasdaq:FKINX) has a few choices. They can keep doing the same old thing that everyone else is doing, hoping for better results. Or, they can fight the vicious low yield cycle with an equally vicious arsenal. What am I referring to? The covered call strategy. Selling covered calls is a conservative income strategy that has proven itself over and over again. Since June 1988, the CBOE BuyWrite Monthly Index (ChicagoOptions:^BXM) has generated a 961% gain compared to a 593% gain for the S&P 500. Furthermore, the BuyWrite Monthly strategy consistently outperformed the S&P 500 during periods when stocks declined. Besides providing a cushion to stock investors, selling covered calls provides an additional source of monthly income. Is it any wonder why we’ve applied this time-test strategy to an all ETF portfolio that owns a variety of assets? Since introducing our Income Mix ETF Portfolio in Feb. 2012, our monthly covered call strategy has raked in over $22,300 of monthly income. We base that amount on our all-ETF model portfolio with an assumed value of $100,000. Each month, we alert readers about our targeted ETF tickers and strike prices along with expiration dates. Since call options prices are impacted by the market’s perception of risk (volatility) along with time value, the actually monthly dollar amount garnered from selling covered calls will vary month to month. Nevertheless, we’ve been able to average a steady monthly income stream of around$825 over a 27-month span. And here’s another added bonus: The potential of capturing even more money from the dividend income from the underlying ETFs we hold inside the Income Mix Portfolio! One more hidden gem of the covered call strategy is the ability to convert non-income producing assets like gold and precious metals (NYSEARCA:GLTR) into assets that produce positive cash flow. Large gold ETFs like the SPDR Gold Shares (NYSEARCA:GLD) have a very liquid options market, giving the income investor plenty of choices with strike prices and expiration dates. Owning physical bullion in a vault won’t give you that kind of financial flexibility. In summary, the monthly covered call strategy is an effective tool for income and ETF investors alike. It’s a conservative strategy that more investors should be using to successfully fight against today’s low yield cycle. The ETF Profit Strategy Newsletter includes the Income Mix Portfolio along with Weekly ETF Picks and Technical Forecast. In 2013, 70% of our weekly ETF picks were winners.